Adhesive pallet stabilization unitizes pallet loads efficiently and complements existing stabilization methods. Astro Packaging’s pallet stabilization systems securely unitize palletized products before, during and after shipment. 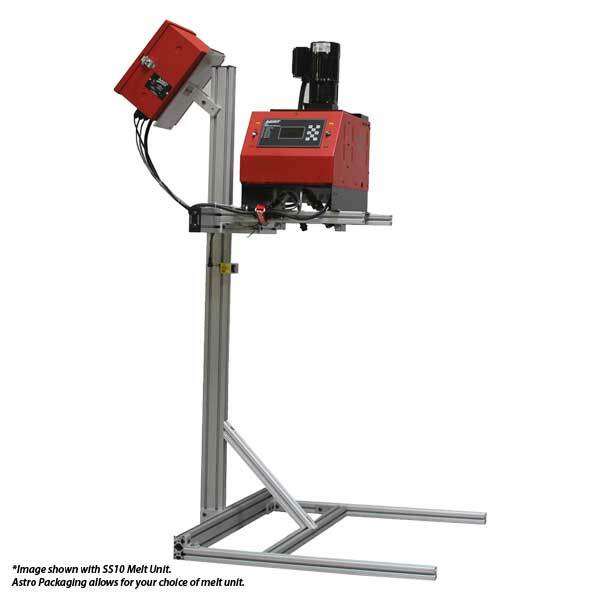 They also extend the stability protection capabilities of your stretch or shrink-wrap systems….even after removal. Adhesive applied to the corners of cases, cartons or bags during pallet stacking reinforces load integrity. Hot melt and cold adhesive systems are available to apply bead, swirl or spray patterns that meet specific product, shipment or storage conditions. The integrated systems include simple-to-use controls, coupled with precise pumping, dispensing and cut-off to make operation easy and reliable. All components mount on an equipment cart that can be portable or bolted in place. Systems can also be installed directly on your parent machine. Several systems can be configured to meet the requirements of stabilizing products stacked on a pallet. Each component in the system is designed for efficiency and economy. The variations available allow your choice of melt unit, applicator head, nozzle configuration, and temperature control. The unique direct mount manifold eliminates the need for a supply hose. Fully customizable frame specifications allow pallet stabilization systems to meet unique requirements of individual production line. Adhesive stabilization provides slip resistance to each package, eliminating shifted loads and product waste before and during shipping. Pallets remain unitized after wrap removal, reducing product damage and potential accidents caused by products falling from high-rack storage. Adhesive strengthens load integrity of slippery or coated box surfaces, improving load stability during transportation. Column-stacked products resist lateral movement when slip sheets are reinforce with adhesive bonds. Cost-efficient adhesive palletizing reduces wrap use and disposal costs. Hot melt adhesive palletizing accommodates most board stock without fear of tear.